I have a very strange feeling about this city. I know, this statement applies to all the cities - urban life has become a very strange kind of living. That is the reason I generally don't say "this is a strange city" - but I can't help it saying about Delhi. I have lived in many cities and always lived as if I was born there and I was going to die there. But with Delhi, it is different. When I came here, I knew I had to leave this city some day. Is that truth makes me feel the strangeness of Delhi? I don't know. A lot has been told and written about Delhi. From ages, people have been expressing their love or there awe about Delhi. However I feel that Delhi still offers an Untold Story, it has the capacity to open its secrets if one is interested. I know, you won't believe me. Alright, take the example of Khan Market. So far, I had visited Khan Market only once - with a colleague from Canada. During those hours I had realized that this place was not for me.When I received a message from Surekha Narain about a visit to Khan Market area, I was surprised. The weather in Delhi was not conducive for moving around leisurely even after a comparatively good rain in August. I had been to couple of places with Surekha and had found it to be good. I mean the group is never too large so we can spend time in discussions and information generation. Surekha always comes with lot of information to share and the atmosphere is friendly and informal. She provides good insights into the places we visit. So I was eager to visit Khan Market. I wanted to know more before confirming and so asked my colleagues, "What is there in and around Khan Market?" Most of them are born and brought up in Delhi - still they looked at me in a weird way, said "Market" and changed the topic. I went to Wikipedia. There I gathered few points like - this Market was established in 1951, it is named after legendary Khan Abdul Ghaffar Khan and it has 21st rank in the list of costly markets in the world!! Reading this, I was caught in two minds - to visit Khan Market or Not. However, I was sure, Surekha would present Untold Story of the area to me. Finally, I decide to go to Khan Market. When we met at 8.00 in the morning outside Khan Market Metro Station, I was happy to notice that the group was not too large. Being Saturday morning, the road was not crowded.At the first glance, a big white building opposite the road attracted my attention. This is supposed to be a rich people's area - so I thought it must be famous residential complex. But I was told that it was the back side of Ambassador Hotel. Later we could actually visit the hotel - will tell you about it after a couple of paragraphs! Outside the Metro Station (Exit Gate 2) we turned towards left. 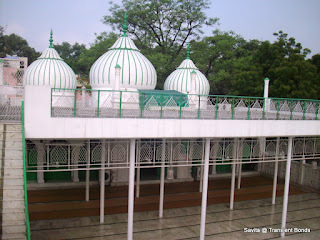 After a peaceful walk for five minutes, we reached 'Bagawali Masjid'. The mosque is named so because during its prime time it was surrounded by garden. There were three four people (all men) praying. We were not sure whether women were allowed in that mosque -so we entered with precaution- ready to turn around any minute. All women in the group covered their head with scarf or dupatta. There were few people sitting in the mosque, but they did not object to our entry so we were relaxed and started enjoying the architecture of the place. From the main road, the mosque is not at all visible - though instead of garden, there is a nursery now. What changed the fortune of this place? It remains an Untold Story for me! Next we visited Sujan Singh Park. This was the first apartment in Delhi built long back in 1945. Who is this Sujan Singh? He is father of building contractor Sobha Singh. Who is Sobha Singh? He is father of Khushwant Singh. (Please, don't ask who is Khushwant Singh!!). 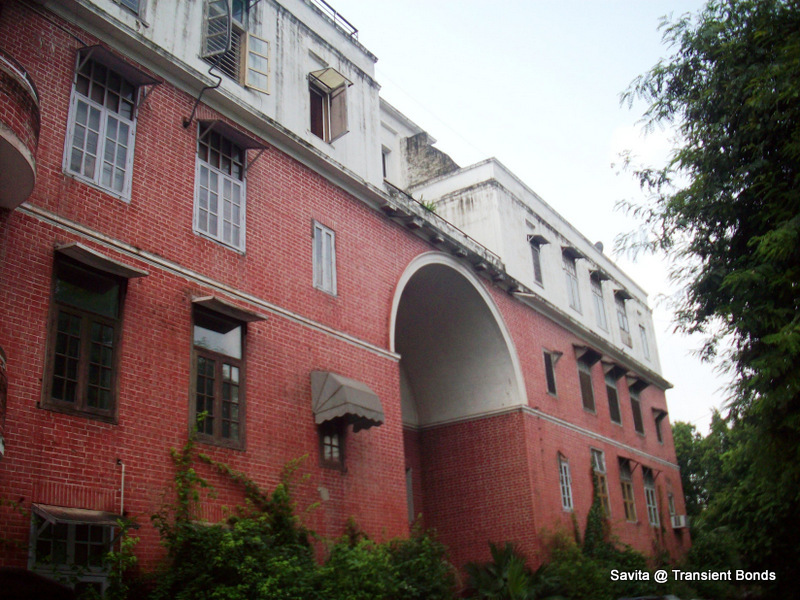 Sobha Singh was prominent builder of Lutyen's Delhi. It is said that not long back half of the Delhi belonged to Sobha Singh.I was pained to note that the city of Delhi elected him not once but four times as President of New Delhi Municipal Council. How can people forget and forgive that he was one of those who identified Bhagat Singh and Batukeshwar Datta for throwing bombs in Delhi Assembly in 1929. Why do we have a very weak sense of patriotism? Well, that too remains an Untold Story! The apartment is extremely beautiful. The serenity catches one's heart. For a moment, we all were speechless. In the midst of high rise building it was nice to have this not so high building. 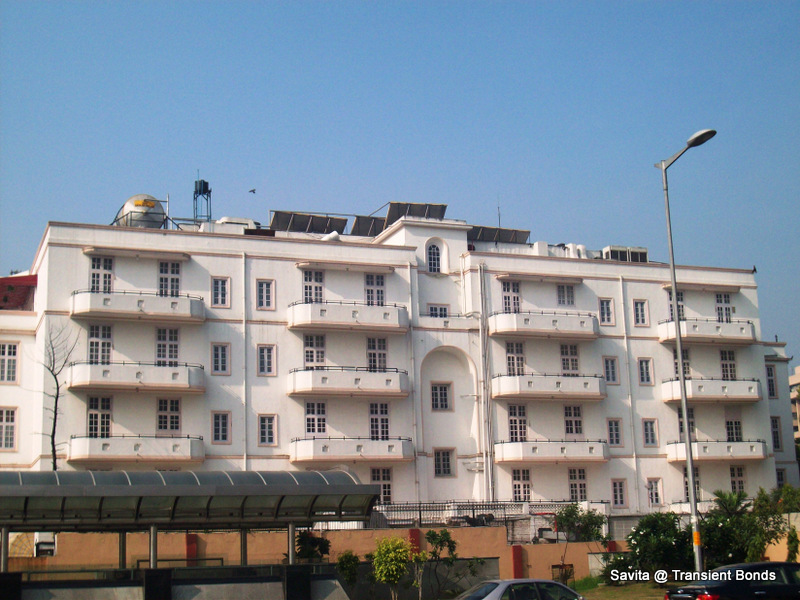 Each household has open balcony - which could be seen better in the earlier photograph of Hotel Ambassador. The security guards came to ask us the purpose of the visit. When we said that we just wanted to watch the building - two of them nodded but nevertheless followed us till the end. Many people must be coming to 'see' this building The complex is 'U' shaped - residential buildings on the three sides with a beautiful garden in the midst, For a moment I thought we were in historical time - but the impression immediately vanished due to modern cars parked there. One of us loudly thought, "what could be the price of one flat in this apartment?" and I decided not to pay attention to such discussion. How many families must have stayed here and how many must have moved out of here! Their story is untold indeed! We crossed the road. We were not sure whether we would be allowed to enter the Ambassador Hotel. Surprisingly the security guards welcomed us with 'Good Morning'. Maybe it is part of their duty or maybe the foreign nationals in our group made our entry easy. 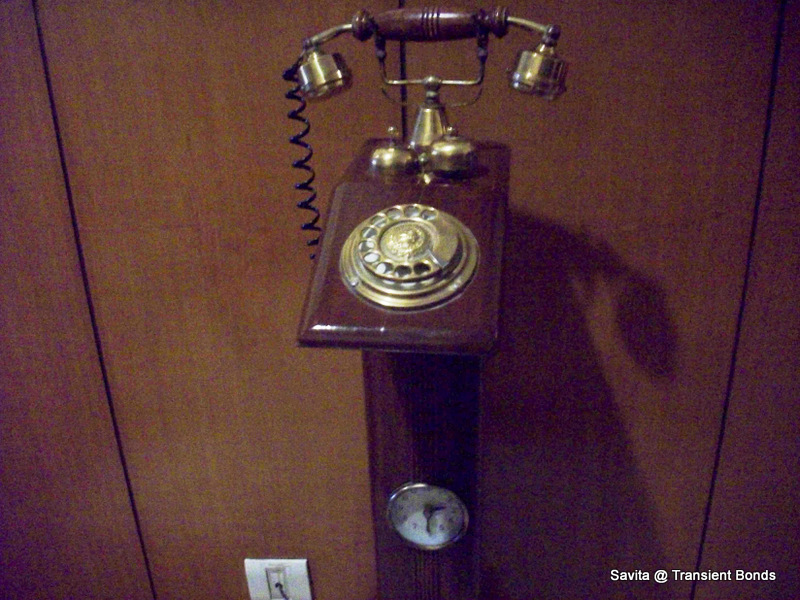 Surekha interacted with the hotel staff and suddenly we were invited inside the hotel. The staff took us to couple of rooms. One of the staff - a man - who has been working there for last 35 years talked about old type of fans, old type of lifts etc. 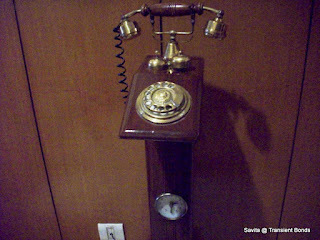 We saw 'ancient looking' telephone in the lobby - which was not working. I felt like I was on the set of some 'old' movie. The hotel walls are white and again in the midst of the triangular shaped building there is a large space. We were told that there was a restaurant in that place. The rooms were good but not worth of charges. I don't who comes and stays in these costly rooms and why. Maybe there are many more Untold Stories!! Our next point was a Synagogue. Here we met the Rabbi and the Secretary Mr. Malekar. According to him there are about 5000 Jew population in India and about 50 people in Delhi who are the followers are of Judaism. However, many people from the various embassies come here to pray.It was nice to here a religious teacher saying: "I am Indian first and Jew later" or "Israel is in my heart, but India is in my blood." We Indians in that group felt good about it. Mr. Malekar briefly explained fundamental teachings of Judaism, the prayer ceremony in the Synagogue. For example the cloth the Rabbi wears during the discourse and the Shofar has historical significance. Nobody is allowed to enter the wooden platform from where the Rabbi gives talk etc. However things are changing now. For example the status of women according to the religion is changing. The tradition says that Torah should not be read unless 10 men are there to listen. But now at least the Delhi Synagogue reads it if there are 10 persons - which includes women. Saturady is a Sabbath day and work is forbidden on that day. However here was Mr. Malkear, working on Saturday and sharing the knowledge with non-followers of Jew faith. What factors contributed to these changes - is another Untold Story! The area has many cemeteries - Jew, Christian and Parasi. We visited the Jew and the Parasi cemeteries Some of the tombs were smaller in size. The realization that those tombs are of young children made everyone little sad. 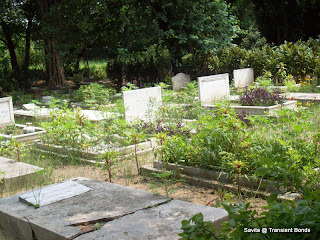 The Parasi Cemetery looked better maintained - though the number of Parasi people in Delhi also is not very high. Interestingly we found that Parasi people have a longer life - whether this is truth or not needs to be checked with other authentic data. We had a brief discussion on how different religions dispose the dead. What kind of life these people had lived - we do not know. We also do not know what they saw and what they felt. Only their memory remains - if someone is there to remember them. Otherwise there are so many lives who carry with them the story of their life - Untold! If you ask anyone in Delhi about Khan Market; ten out of ten people would say that it a place for shopping. Here we were, a group of people, spending two and half hours in the area - without visiting a shop, without visiting a restaurant and still feeling full. To some extent, I understood the Untold Story of Khan Market area that morning. But many aspects of the story need to be explored. Let me see when I get the opportunity to visit the area again! Let me see what this strange city of Delhi reveals to me. This is such a fascinating post. Loved it. I got to know so much about this place. I love such untold stories associated with places. I would have definitely voted for you if I had been participating in blog-a-ton this time. Very well put!! Khan market reminds me also of a chic market...honestly, you know how to live well.. live wisely ...live humbly. An untold story in nice details! Thanks muthu, The Fool, Panchali and AmitAag. I absolutely loved this post !!!! nice take on the prompt.. Thanks TTT, odyzz and Sapna. I never imagined this prompt would be used for a place! Pretty detailed and informed! Just love how easily you share your thoughts with the reader. No garnishing, no unnecessary adjectives, no heavy-power vocab - makes me think that this writer is just like me. It is a very easy read and captures quite some great thoughts, and of course good info. Do visit mine, it's on the creative side - will be very glad to hear your thoughts. 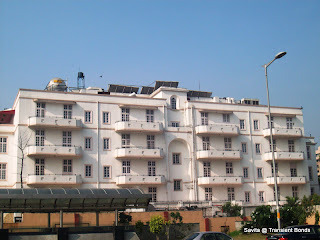 I knew Ambassador hotel and Sujan Singh Park in that area. 30 years ago that place was also famous for a tikki-chatwala. But so many other places like the cemetries and synagogue, I had never heard of them! Not just Sobha Singh, but if you look at all the Indian history, the masters might have been British, but guns were fired, people were were beaten or hanged, all by our own Indian soldiers. In Germany, the war commission did not accept the logic that germans were only following orders, but in India this logic is easily accepted! Our soldiers, our judges, our officers, our nobility from British India continued to enjoy all their perks without ever explaining themselves to anyone. Who had hanged Bhagatsingh, must have some Indian as well, so why pick on Sobha Singh only? Nice post. It always interesting to hear untold stories of places, every place has one at least! Thanks Deepa. Actually places like human beings have many stories to share. Thanks unknownshree for your encouraging words. Amit, I am glad that you liked this post. Sunilbhai, thanks for sharing your experience of the same place. I am sure, during your next visit you would certainly go to Synagogue and Cemeteries. They are at a walking distance from Khan Market Metro station. You are absolutely right about the insiders' role into exploitation and abuse of our countrymen - and even other countries. I have not picked up Sobha Singh - he came in the picture because of Sujan Singh Park. Sobha Singh was coincidence - not design, simply because I do not know much about him. There were many more such people, there are such people and there will be such people. I just wonder whether contemporary society treats people differently, and why. It is possible that we gain more knowledge of the past when we actually pass it. So, the understanding and hence judgments would certainly differ! TF - How come I am reading your post for the voting session then? This is more like an informative piece than a standard blog contest and I think it's great. Deepa, Sorry, could not follow your comment. I guess, it was meant for some other blog?? Very fascinating post. Good Luck. Savita, I was thinking that even Bhagat Singh himself didn't believe that other Indians were guilty in the sins of British. He was angry with Gen. Dyer for Jalianvalla Bagh massacre and killed him but even in Jalianwalla, there were Indian sipahi who were "following orders" and had shot at unarmed women and children. May be it is our national trait, accepting the sins of fellow Indians who follow orders! Sunilbhai, the policy makers always have more responsibility and they get more credit when things go well. Those who are down the line sometimes have livelihood issues and they are compelled to act the wish of their master. That is how we treat people - that is why a railway minister is supposed to resign after a bad accident though s/he was not driving that particular or train or coach/captain resign after failure in world competitions etc. Megha, next time you go to Khan Market, walk a bit to visit these places and you will get more hungry to consume good food! very detailed collection of untold stories...enlightened!!! Thanks Karan, SiS, Remijee and Diwakar. Glad to know that you found this post informative. I have always considered myself a mumbai person rather than delhi, but will visit khan market with a new perspective. I am fortunate for having landed here accidentally. I never knew about this blog of yours. I was sad to learn about Khushwant Singh's father. It was strange that you could visit the Synagogue on a Sabbath day. Yes things are changing. aexcellent post and I could learn a lot sans Shopping. chips from a life, I am sure, you will enjoy! Anonymous, kindly provide link of your blog. Arjun, virtual tour! Please, have a physical one when you get an opportunity. PNS Sir, welcome to Times Change as well! Fascinating take on the theme! Good luck for exploration Ash!